Occasionally, it takes me a while to get around to getting a review up. I’ve had this wonderful bottle of tonic syrup chronicled in my notes for some time. I unexpectedly received another bottle very recently which prompted me to look in my notes and realize [to my chagrin] that I have not written about this fantastic syrup here. 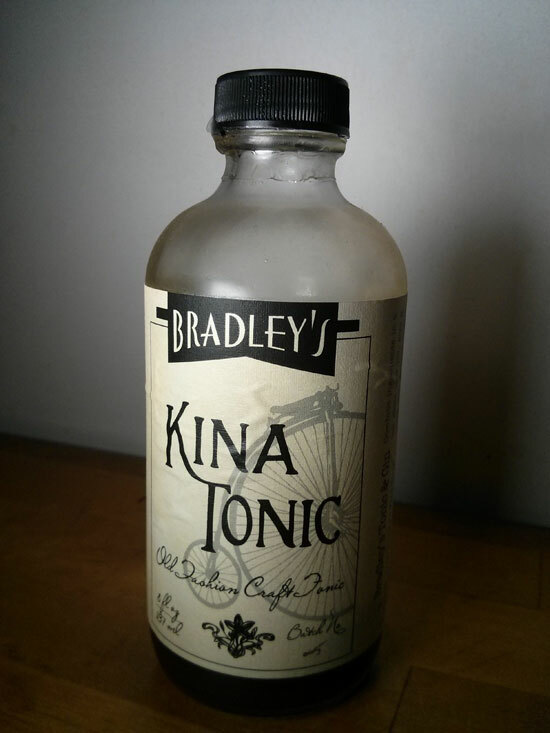 Bradley’s Kina Tonic is small batch, made by hand, and hails from Seattle [Hi Seattle!]. It’s alike many other tonic syrups in terms of appearance and aroma; however, you won’t quite know exactly how it differs until you open it up. That’s right, the “spices” labeled on the back are not listed. They’re a secret. You’ll just have to taste for yourselves. The color is a light cocoa, with this hint of rusty maroon, giving it an almost ciderish appearance. The liquid is thick and somewhat viscous; however, not unctuous I’d place it somewhere in the middle, and perhaps slightly less rich and syrupy than other tonic syrups. The nose is lemongrass, orange, and nutmeg. It smells a bit rich and earthy, with some background notes that read as somewhat sweet; however, it is the spice and citrus which carries through most strongly. On its own, there’s a citric acid bite at first. The mid-notes bare the rich complexity of the spice bouquet at work here. Although the list isn’t published, we might be able to make some guesses; however, syrups I think often present a clustered/muddied note which is harder to break up and tease out the individual elements than say a spirit might be. There’s notes reminiscent of ginger, that lemongrass note that was quite prominent on the nose, and then a rich complex spice menagerie. On the palate it seems to read more clearly as cinnamon, nicely counteracted by a brisk tannic note added from the quinine. Trying to tease out additional complexities with water, the citrus became a little bit more rounded out, with orange and lemon coming through. Cinnamon seems most likely to be a “yes” on the list of ingredients, with a rich creamy texture that calls to mind vivid Vietnamese Cinnamon. My biggest critique is not unique to this tonic syrup. It tends to overpower lower-proof gins. For example, you don’t get a lot of notes from through with a 37.5% gin [other than blissfully drunk, from not being able to taste the gin that is]. But when mixing with a 45% gin, this is the sweet spot where I think the tonic [in the ratio prescribed] was able to bring the best out of each other. If you must use a lower proof gin, I’d suggest adding a bit more gin, and a touch more syrup.